Do you have questions about organic petrology and its applications? E-mail your question to Brett Valentine and he will find an expert to answer it. All questions are welcome, from science and applications of organic petrology, types of microscope equipment and laboratory methods, to careers in organic petrology. Q: Some authors say that vitrinite reflectance is a paleothermometer. Is that correct? I understood that the reflectance represented the attained maturity level, which is a function of both time and temperature. A: Vitrinite reflectance is a function of (T, P, t) and reflectance kinetics is an active field of research. However, T generally is considered the most important variable and since VR is not retrogressive most would say that it is representative of maximum T obtained during burial. Q: I am trying to find somebody to do vitrinite reflectance work. Any suggestions? A: Many commercial laboratories are available for vitrinite reflectance and other organic petrographic analyses. TSOP would be pleased to provide suggestions based on the specific nature of your analytical needs or assist you in identifying collaborators for research projects. Please also visit our Petrology labs page. Q: Would you please recommend a geochemical laboratory that can identify and certify the identification of solid bitumen? A: Many commercial laboratories are available for petrographic geochemical characterization of solid bitumens. TSOP would be pleased to provide suggestions based on the specific nature of your analytical needs or assist you in identifying collaborators for research projects. Please also visit our Petrology labs page. Q: Could you please tell me where I can get standards for calibrating the microscope photometer? A: Standards can be purchased from Klein & Becker or received on loan (with deposit) from several laboratories associated with ICCP. Q: What commercial techniques and instruments are available to determine whether a coal is oxidized or not? A: The Free Swelling Index test ASTM D720 is mostly commonly used to test for coal oxidation; the Alkali Extraction test for bituminous coals, D5263 is used as well. Also, the Gieseler Plastometer test ASTM D2639 is sensitive to oxidation. Oxidation can be inferred from many properties, including lowered calorific value, and can be viewed petrographically as brownish or darkened ragged rims on coal fragments and the presence of desiccation cracks. Q: Please could you tell me what kind of standard for vitrinite reflectance should I use and where can I get them? A: Coal petrographers use ASTM D2798 or ISO 7404 for vitrinite reflectance. The standards can be purchased from ASTM or ISO. Q: How can organic petrological techniques can be effectively utilized for research in shale gas systems? 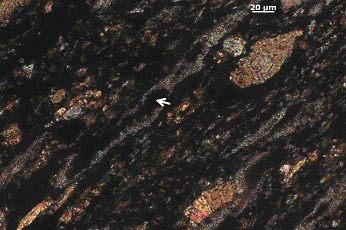 A: Organic petrographic techniques can be utilized in shale gas research for many applications, most importantly thermal maturity determination and kerogen typing. Q: What are these things? The sample is from the Nordegg Member of the Jurassic Fernie Formation. A: They probably are agglutinated foraminifera.